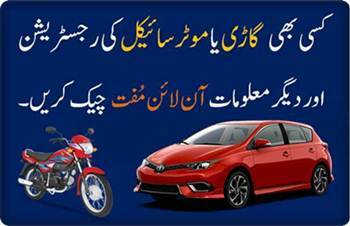 MTMIS is an online vehicle verification system by the Government of Pakistan to check and verify vehicle registration details and all the relevant information of vehicles. This system is developed by provincial excise and taxation departments. Punjab has developed its own online system under the name of MTMIS Punjab. While Sindh and KPK have their separate online systems for vehicles verification under different names but for simplicity we call them MTMIS which is abbreviation of Motor Transport Management Information System. This online information system is useful for general public and government departments especially Police, Taxation and Revenue Departments. MTMIS online system does not only help in keeping the records of automobile taxation and computerized registration but it is also very useful for prompt checking of any vehicle’s details at the spot by law enforcement agencies. Availability of online details is also helpful in the hassle free, transparent buying/ selling of these automobiles. It may further be used in motor vehicle examinations, issuance of fitness certificate, route permits, driving licenses. It can also be usable for enforcement of traffic rules and regulations and computerization of criminal records. From all of the above mentioned possible uses of this online data, we are only concerned about its use for public when they are buying a new vehicle especially from a stranger, from a car dealer and when they found the car seller on any website e.g. OLX and PakWheels etc. As it is not easy for a common man to verify any data from any government office in Pakistan so such website and SMS based services are everybody's demand. It becomes very crucial for the buyer to verify all the details of the vehicle before making the deal. This information is also very important if there are any token taxes are unpaid, especially when the car is luxury because the tokens and other taxes for luxury cars are also very high. When buying a vehicle, firstly you should get it checked by a skilled auto mechanic or from any of your trustworthy friend who have sufficient knowledge in this field. Next step which is equally important is to check the registration book physically and matching the registration number, engine number and chassis number of the vehicle to the registration book. You should not only check the hard copy but also check and verify online data, if available. Currently online data of only Punjab, Sindh and KPK is available and online data of Islamabad ICT, Balochistan, Gilgit Baltistan and AJK is not available online. Moreover, sometimes data of very old vehicles is not available online or very new registration and recent change in the data may not be shown in the online data as it may take some time to reflect in the online data. How to Use Online Vehicle Verification System? It is very simple to use. Simply visit the MTMIS website of the relevant province, enter the registration number of the car, bike etc. Or you can use this service via SMS where available. System will search the record. If the record found it will return requisite information, otherwise it will show the message that "no record found". The following information will be shown when you request the details of a particular vehicle. This free service has proved its usefulness. And it is hoped that all the motor vehicle registration authorities in Pakistan make such systems to facilitate citizens of Pakistan by providing this information online.